Picture by JASON HEDGES Job Number: CR0006201 Farm feature on Fodderletter Farm near Tomintoul. Farmer Michael Robertson and SAC Beef consultant Sarah Balfour are pictured. Father and son, Billy and Michael Robertson, farm 1,100 acres of hill and rough grazing between Mid Fodderletter and Easter Fodderletter, along with Michael’s partner Ellie, his son Mark and Ellie’s daughter Sarah Balfour. They run a 100-cow suckler herd of Limousin and British Blue cross cows, including 15 pedigree Limousins under the Fodderletter prefix. The sheep flock includes 320 Cheviot ewes put to the Suffolk, and 40 Cheviot gimmers put to the Rouge. No strangers to the show and sale rings, the team at Fodderletter regularly wins rosettes at shows, as well as Aberdeen and Northern Marts’ Thainstone Centre where 10-12-month-old limousin cross calves from the herd often top suckled calf sales. Last year, a batch in September averaged 240p per kg and another in October cashed in at 243p including a top price of 247p. The top draw of spring calves is sold straight off their mothers in November, while the rest are kept on and sold in April. Two six-month-old heifer calves by the British Blue stock bull Midlock Jackpot, were sold at Huntly, last October. One weighing 255kg sold for £1,500 and the other at 290kg made £1,250. Michael says these results are down to the good genetics of the Limousin and British Blue breeds. “The Limousin really is the ideal breed for today’s market, producing the type of calves that the butchers’ want with the correct weight and spec,” he said. Originally, the family ran a herd of Hereford and Angus cross cows put to a Charolais, but calving problems led them to the Limousin. Their first Limousin bull was the 4,000gn Muirhouses McCoist, which produced several show winning calves and his progeny are now some of the best commercial cows in the herd. Other bulls to make a stamp on the herd include the 6,800gn Spittalton Gold, whose first son was overall champion at the Christmas Classic and sold for 6,200gn, and British Blue bull, Bringley Cosmo, which has bred good replacements and show calves. The family’s pedigree herd was established 25 years ago with the private purchase of the maiden heifer, Eden Margaret, bred by Andy Holliday in Cumbria. Michael was given two straws of Broadmeadows Cannon as a lucky penny and the first calf from this breeding sold for 6,200gn at Perth Bull Sales. Her daughters also did well and one bred the reserve champion at Carlisle in 2012, Fodderletter Gatuso which sold for their personal best of 10,000gn. Michael says the pedigree cattle are commercially run and receive no special treatment. Mark is a full-time bricklayer in Dufftown and Sarah is a beef consultant for SAC. 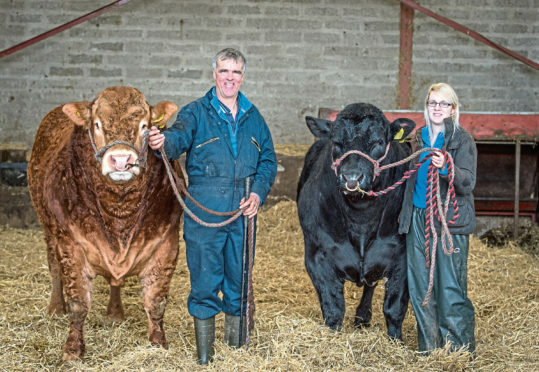 They both dedicate their spare time to the cattle and in recent weeks, have been preparing entries for next week’s Royal Northern Spring Show. The Robertsons believe this is the strongest show of calves they’ve ever had for the event, which includes the Rising Stars champion heifer named I’ll Be There, two British Blue cross heifers – one of which is home-bred and will be retained for breeding – and a Charolais cross stot which stood third at the Rising Stars. The team also has two pedigree bulls for sale including the 18-month-old Fodderletter Nimrod, which was successfully shown in the summer and is the last son of Spittalton Gold to be sold. The other is Sarah’s first British Blue bull to be sold from her own herd, Fodderletter Mister Tom, by Midlock Jackpot. A pedigree Limousin heifer named Fodderletter Nivea, which is an AI daughter of Mereside Lorenzo, is also up for sale.